While Peter Callas is an internationally recognised media artist who uses state of the art technology to a high standard, I would like to begin by stating that Peter has been a cra-sman of the Fairlight Computer Video Instrument (CVI) – a less known, unique video computer – for years. This declaration seems to me important and not in the least bit demeaning. It means that Peter, as a good artist and cra-sman, came to know his chosen tool so well that he could not only do anything with it, but its limitations – or even defects – were turned into a special, unique visual world in his hands. I think a visual artist is the type of person who needs feedback from the material that he works on. It is this solid ground that he can utilise as his springboard. Computers or so-ware are materials just as canvases or oil paints – they also have their properties and limits. If someone does not become properly familiar with these, he will collide with them and instead of springing off, will only struggle. The following thoughts I have never had the chance to discuss with him. They may not even be true. Let us just say that this is the personal Peter Callas myth that I have came up with about how he created his works. In the days when Peter was working with the CVI, I was experimenting with Atari machines. As the capabilities of these apparatuses were quite similar, I think I have a good idea as to the problems Peter had to face in his work. The personal computers of this period were, of course, much more basic than those we use today. From the standpoint of imagery, the determining features were mostly low resolution, few colours and small memory. The latter meant that the computer could only play moving images that were short, only lasting a second or two. In my personal experience, most artists were discouraged by these limitations. Peter, on the other hand, was inspired by them. His ingenious invention was the application of layers, through which he simultaneously resolved all three problems. In his works, in each scene, two or three layers were superimposed on each other. As each layer could have its own colour supply, taken together they could use many more colours than a single layer composition. Thus, he was able to sidestep the colour limitations of the hardware. While an increase in resolution could not be achieved through the same technique, I saw in a number of scenes, that Peter had used layers of varying resolution within the same composition. In this way, he could creatively play around with resolution as well, so that instead of being a compulsory restriction, it became a conscious element of creation. He could also evade the problem of the short play time resulting from small memory space by using the various layers as different time planes. Because of the brief, few second-long play time, Peter used looped animations. Though these repeating movement cycles could have easily become boring, Peter, through applying the layers, made them extremely intriguing. He used cycles of varying length and speed in each layer, in some cases even temporally shi-ing them away from each other. In this way, instead of monotonous repetition, a forever changing interference of cycles was created. I don’t know if this is really how it happened, but, nevertheless, I figured that since Fairlight computers had a video input and output, Peter may have bought, say, three of them and played his first animation layer on the first one, which transferred the signal to the second computer, which superimposed the second layer and sent the combined composition on to the third machine, where a third layer was placed on top of the previous two. This is how I imagined it and was very jealous that he had such a magnificent computer. All this was back when I worked in Hungary and Peter worked in Australia. Because of the distance, imagination took the place of facts. Later, I saw that Peter usually completed his works in professional video studios, so it was more probable that he built the layers there. All this doesn’t really matter though. What is important here is not so much the specific technique, but, rather, the ways in which technical restrictions, in the hands of the right person, inspire one’s unique creative method. This sort of approach is rare. Instead, most artists say: “I would like to create a certain spectacle. Show me the so-ware that can do this”. Works generated in this way are, in most cases, valueless, as the artist has only used something that was already available without adding anything of real value to it. This is why I hold Peter Callas’ artistic and technical inventions – his artistic and cra-sman- like approach – in such high regard. I am convinced that it is this attitude that is of crucial importance and – now we can leave Fairlight computers behind – not the computer or the so-ware one works with. 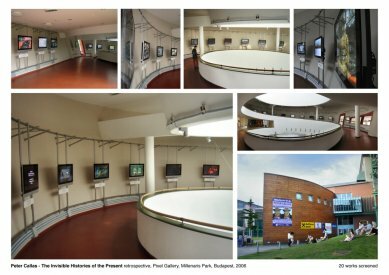 I think all artists who love their profession know what I am talking about: moments, like the one where Peter turns to me in our shared room at ZKM and says “look at this water animation – I made it from one image”. In other words, he has drawn only one image for it, but has done that so well that by shi-ing it with each frame, the impression of the vibrating movement of the water surface is created. He is bright-eyed with suppressed fervour in his voice and, indeed, there is a stylised water surface rippling on the monitor – and it is beautiful. A masterpiece. If there is such a thing as a cosmopolitan, Peter Callas is it. He is always on the road, but never as a tourist. Tourists are not interested in the problems of the natives; they travel only out of a need for recreation. Peter, on the other hand, travels with his eyes wide open. He is interested in – and wants to understand – everything. He already has a great knowledge of art history and politics, which he crosschecks with these experiences. His questions sometimes completely perplex the natives (me, for example). But his letters are mostly poetic with political overtones, and sometimes with gentle irony. I am glad that Peter has been sending me these letters for over 10 years. The other permanent participant in Peter’s journeys is his wife, Yuri, who happens to be an excellent jewellery artist. Every letter is a new chapter from a philosophical and funny adventure story: the escapades of Peter and Yuri on the planet named Earth. This is what is left for last, though it is obviously of the most importance. The reason this is the third point is that, in my opinion, Peter’s art is built on his cra-sman-like attitude and his cosmopolitan travels. While the aesthetics of his work are in large part a result of his knowledge of and love for the profession, their subject is Peter’s intense amazement at the world. Peter works exactly like an artist, in my opinion, should. He works for years on a new piece. He engages himself in a solitary struggle with the task. (From among motion picture artists in Hungary, Sándor Reisenbüchler also worked in this fashion.) Peter takes a great number of photographs during his travels. For this, he uses no special camera equipment or lenses; he does not work like a photo artist. His pictures are rather notes, sketches and raw materials for a later work. Many other materials that Peter deems important will be added to these photos: articles, books, or statistical data. Then, after the piece is finished, the photo is present only as a single component of one of the layers of a scene. In other cases, facts that were gathered during the course of months make for a single, few seconds’ flash of a composition. Thus, Peter has a dramaturgical technique of extremely strong condensation. Upon first seeing his works, I imagined their coming into being as follows: Peter decides to do a piece about Europe. He comes here, travels to the main cities, looks up his friends here, makes new friendships, and travels around. He takes photos, notes, and buys loads of books. The mass of papers keeps growing and getting heavier. His room fills up, you can’t even move from all the gathered materials. A-er a while, he cannot take it anymore; the torrent of information must be processed. Naturally, a lot of ideas had come to him, even while collecting the materials. He begins to make his selection based on these. He uses only small details of individual photos. He is not satisfied by the traditional montage technique, he places the components not only next to each other, but on top of one another in layers. He traces them in order to make them fit better. He keeps condensing the mass to an ever-increasing degree. Animation is very suitable for this. As there are 25 frames in each second, every frame can accommodate multiple layers, and every layer can hold a lot of image-information. Finally, a certain density is reached whereby the compressed material suddenly explodes. Now this explosion – this is the new Peter Callas work. Peter contentedly wipes his forehead. “Once again, we have managed to create a nice little bang”, he says, and then sets off on another journey with Yuri. 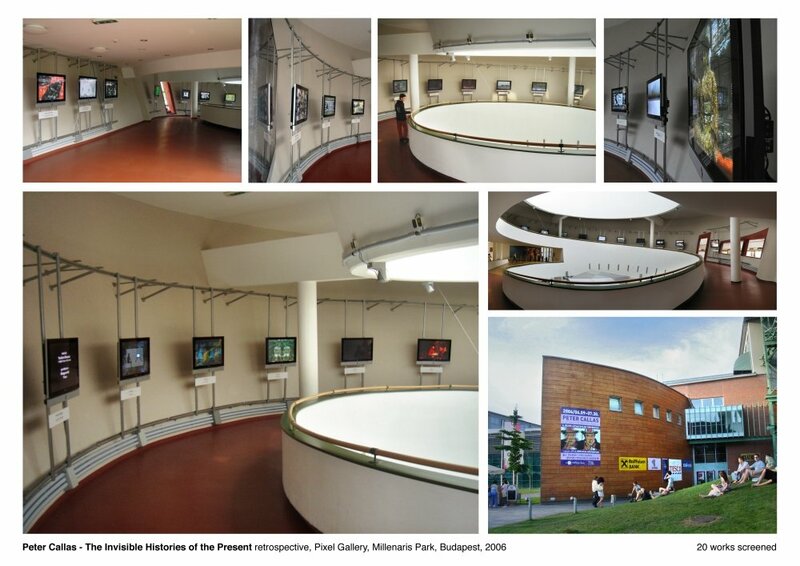 Peter Callas: The Invisible Histories of the Present, Retrospective, Hungary, 2006.